Create your own Bingo cards...get creative! You are here: Home / Fun Activities For Kids (By Age) / Create your own Bingo cards…get creative! Create your own Bingo cards…get creative! 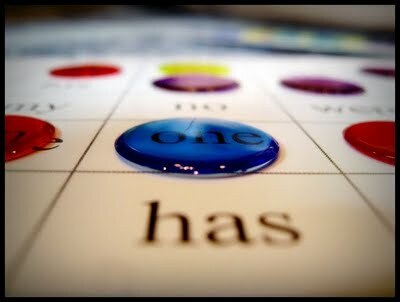 In first grade, Reese’s curriculum came with Sight Word BINGO, and it was one of the things he asked for almost daily. We enjoyed playing it through last year, but frankly, the words are very simple & I am ready to challenge him some more! So, I looked up a 6th Grade Sight Word list and used Bingo Card Creator to make an updated version for this coming year. There are 23 short lists in the 6th Grade Sight Word list, so once Reese masters the 24 words in our first BINGO game, I’ll return to make new cards with new words. I have found that changing up our learning experiences makes Reese really happy…and if he’s happy, Mama is happy! If you would like to create your own BINGO game, think of all the things in your child’s life & get creative. Family names? Holidays? Level-appropriate sight words? Food names? Foreign language words (I will be making a Latin version soon!)? Everything is more fun if it’s incorporated into a game!